As a busy business person I know you are hustling. Hustling aka working hard to connect in any way you can with those future clients and partnerships that will keep your business booming. And though I talk mostly about connecting online, it’s a fact that I live with too: a lot of great networking is done (and has to be done) IN person. And hopefully collecting a pile of business cards at each event. But there is a strategy to take your in-person networking to online connecting, where it is vastly easier to stay in touch, stay top of mind, and stay relevant in busy lives. How to take your in-person networking to online connecting to stay in touch. Today I want to share some tips with you on how to stay in touch after an in-person event in order to forge powerful relationships online. 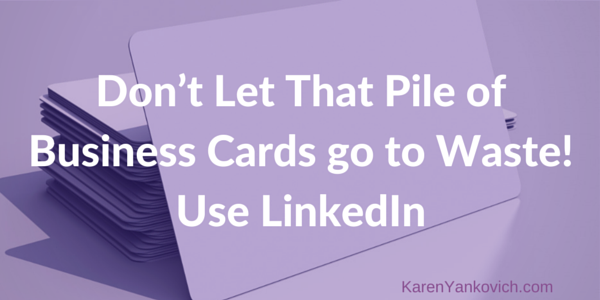 First: Make sure you have your LinkedIn URL on your business card. This immediately tells people that you love to connect on LinkedIn. A small addition that frees you up to actually enjoy the event (which makes you 100 times easier to talk to) and leaves the heavy lifting of selling “how great you are at x,y,z” to your professional and polished LinkedIn profile. Second: Use Evernote (my favorite) to take a photo note of each business card or scan the cards into your computer right away. Type in a quick note as to how you met and possible follow-up potential from your conversation at the event. Do not, I repeat, do not toss these cards into your inbox to do “tomorrow” or later in the week. You will forget valuable information that will have fled your memory after a busy week running your business. Third: The very next day go through this list and connect with each person who is on LinkedIn. Give them a TAG. You can create specific tags that will jog your memory of how you met such as: Chamber of Commerce. Save that tag to add others to it from the same list of business cards. When you send the connect request make sure your it is personal. Please don’t use the generic LinkedIn connect request form email. While the generic request does serve it’s purpose – you have actually connected with this person in person. So adding a note as to how you met and possibly what you chatted about goes a long way to building trust and forging a potential relationship. Finally: Go to their profile and add the note about how you met and set a reminder to follow up in a week or a month. You can find this underneath their profile picture in the white box marked Relationship. Now all of this valuable information is stored on LinkedIn and visible only to you. This is a fantastic way to keep your CRM up to date, organized, and ultimately helpful to you as you forge new business relationships and keep old ones fresh from online to off. Do you have a question about tags and notes and reminders on LinkedIn? I’d be glad to answer! Join me in my LinkedIn group where I answer questions like this and more. You never have to navigate LinkedIn alone again. Yummy, juicy stuff, Karen, and excellent idea! Thank you. Great tips! I love how you combine in-person networking with online networking, thanks!